John Greening, (Judge) Linda Saunders and Scott Elder. John Greening's adjudication report follows the winning poems. he’d wised up on in the racing columns. yelling its name at the finishing line. and put them on to look into the future. What is the difference between luck and grace? of wind and wish towards a promised land. awarded in those days for a hole-in-one. sweetly on the green and trickled home. Let her do it without a destiny. Let her do it as the ugly sister. at this dragon of a day. smug as a moon on the step. of love, or the hope of love. and cannot meet her eye. Let her do it with bursitis and rheumatism. Let her sweep it all up. To anyone who doesn’t spend a lot of time with poetry, it may seem impossible, even outrageous, to think that a judge can actually read 800 poems, let alone choose between them. But in the early stages it’s really no different from the chef who dips a finger in the sauce and knows immediately whether it’s any good. You wouldn’t expect much from a chef who’d never eaten well; who only knew English food of the 1950s, for example, or Victorian puddings. The same is true of poets who don’t read poetry. most often in a good poem it will be the language itself. When Tom Stoppard was asked what Rosencrantz and Guildenstern was about, he said it’s about to make me rich. Bob Dylan had an equally witty reply. I think the best answer to the question, ‘what are your poems about’, is that they are about language. some awareness of space and structure, of the extraordinary power locked in a line-break. (not as much Brexit as I feared). There are – as always – many, many nature poems. Oddly enough, in published volumes of contemporary verse, you won’t find a vast number of those. That’s probably because a nature poem is very difficult to do well. The temptation is to describe, to pile on the adjectives. Poetry is more about what appears when you start taking things away. Cut out everything you dare, as Basil Bunting said. See what you’re left with. There was inevitably a lot of death. I have no problem with that – the elegy is among the most appealing genres in English poetry. But again it demands tact and judgment of tone. If you’re elegizing, it’s not a bad idea to have read Bishop King and Hardy, but also Douglas Dunn, Christopher Reid, Deryn Rees-Jones, Elaine Feinstein. There’s no point in writing poetry without reading the stuff. Among the pieces that I enjoyed before the final sifting began, were poems about sardines, about shags, the Northern Lights, a Moorish palace, an old coat, a church door, Icarus, Edmund Burke, Olga Rudge, Georgia O’Keeffe, a mirror, a telescope, a beetle, Vietnam, knitting, how to recognise celebrated poets from the rear, greenhouses, geese, anger, grief, salt, the Titanic, the sea, the sea, the sea. And of course poetry itself. Perhaps all poems are to some degree about poetry itself. Yet in the end what a poem is about is really not the point. Some of my favourite poems I have no idea what they are about. My final list of ten fell into place fairly straightforwardly, and quite early on I sensed who was going to win. Yet I went back several times to the best few dozen, changing my mind, but generally sticking with my first instinct - which was for those poems which avoid rhetoric, which work hard without necessarily showing it. Sometimes it came down to just one false move, one smudgy line or misjudged word. If I couldn’t decide, then I went for the poem whose music most convinced me. There was some very fine writing and I wish I could have named a top twenty. That’s definitely the most painful part of the process, and I’d like to thank those who submitted: many more of you deserve prizes. Of my top ten, I’ll say a brief word about each poem and we’ll hear some of the winners read. I’ll save the three prize-winners until last. ‘A Wooden Box’ by Howard Wright was a poem that grew on me and slipped into the top ten at the very last minute. It’s appealingly elusive and cinematically atmospheric. There’s a confident use of line-break, and a consistent tone. Keats would have admired what he called the capacity to be ‘in uncertainties, mysteries, doubts, without any irritable reaching after fact and reason’. ‘Since Eels do not Keep Diaries’ by Mark Cooper feels as though it could be part of an eel sequence. It takes what is presumably a historical fact, a detail from the life of Freud, and describes it from the eel’s point of view. It’s a short poem, but nothing is off the peg, there are all kinds of felicities and arresting moments. An admirably clear style, too, and a terrific last line. ‘When the Music Stops’ by Gill Learner might well have been entered because its author knew I liked music. Well, I was certainly the right reader for its ingenious use of 24 titles from standard (and not so standard) classical repertoire from Vivaldi to Wagner to Dvorak to Britten to Messiaen to Adams. It even begins and ends with a famous Beethoven quotation. Caviare, perhaps, but delicious stuff. And very well judged with little musical flourishes in the writing. ‘Alone in Verona’ by Pamela Job is more densely written than some of my top choices. Kingsley Amis used to tut-tut about poems set in art galleries – but who cares any more when it’s this well done? In lovingly crafted quatrains, with a gentle guiding hand, and a convincing sense of when enough is enough, the poet quietly wins us over. It is formally very assured, and tells us interesting things, without becoming prosaic. ‘Cowslips’ by Stephen Fisher I liked a great deal even if I didn’t fully understand it – certainly there is much more in the poem than cowslips. It was one of the most ambitious pieces, pushing the language in challenging directions, toying in a fascinating way with teasing rhymes and rhythms. There is more than a touch of the Metaphysicals about it, George Herbert in particular, and something of Basil Bunting, Marianne Moore & Geoffrey Hill, too. ‘Thanks a lot, Shakespeare, for the Starling’ by Jonathan Greenhause shows just how much there is to be said for an inviting title – it certainly gives your poem a better chance in a competition. This felt a very American poem (the length of the title was one clue) and I responded to it at once: it’s not easy to balance formal assuredness with an anecdotal relaxed quality – moving perilously close to prose, but just sufficiently heightened. And it’s full of diverting material too. ‘Snow’ by Shae Spreafico was a surprise, a little gem that grew brighter each time I returned to it, so that it came to feel like something I already knew. It’s rare to find a modern short poem in rhymed quatrains that succeeds without sounding like Wordsworth, Housman or Emily Dickinson. They are certainly within earshot, but they would be impressed. The extended metaphor of conquest is wonderfully apt. And what a beautiful last line, in its sound, its immaculately judged weight, and its bold choice of ‘imperium’. In 3rd place, is ‘Beyond the Tent’ by Scott Elder. This is a fascinatingly laid out poem, a duologue, two voices singing together in the plainest of language – and here we do have a real sense of music in the words. The rhythms and aural interplay are much of what make the poem succeed, as well as those discreet internal rhymes (slipped/grip) and alliterations (piece/pitched, slow/sold/scrap). It’s a very good title too. It felt as if it might be part of a narrative sequence, a little drama even, but that doesn’t limit it. Nothing is overdone, nothing is obvious, but nor is it wilfully obscure. What we are given in fewer than 80 words tells an intriguing story, a very sad one if true. I kept asking myself, can so simple a poem really trump all those other filigree flights of intellect and poetic ambition? It does, because it achieves what it sets out to do, brilliantly and subtly. In 2nd place we have another bold title, ‘Cinderella and, by extension, all other stories’ by Tom Sastry. This poem uses anaphora, the repetition of the same phrase, to provide its structure. That can be very dull if mishandled, but this is a free verse triumph. The lines are economical, varied, take unexpected directions – as in that superb withholding of ‘do it’ on its fifth appearance – and we’re kept on the edge of our seats as to what ‘it’ actually is. There’s wit, a strong sense of personal involvement, the poem’s images are always in sharp focus, and there are lovely musical touches such as the way ‘Let her age’ emerges climactically from ‘and cannot meet her eye’. There is no waste material here. The writer has learnt from poets as diverse as Ted Hughes and Penelope Shuttle how to do this kind of thing. 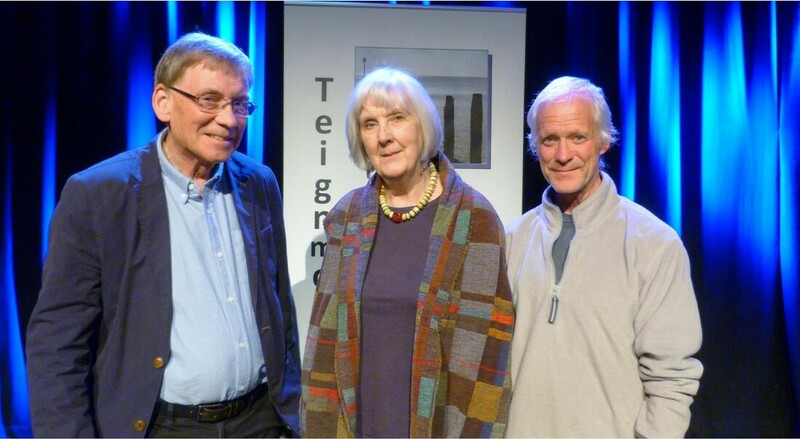 The winner of the Teignmouth Poetry Prize is ‘Outside Chance’ by Linda Saunders. This very fine poem is a portrait of a man (whom we may or may not be meant to recognise) evoked in simple formal tercets. As a piece of characterisation alone the poem is very strong, but it is the sustained tone (cool, thoughtful, ironic) that initially impressed me. It opens assertively and arrestingly – in fact, the first lines open up several possible directions in their tense and in the ambiguity of ‘give a lift’, which shifts across the line to a horse race, a dream, then a battlefield. The language is a successful blend of the colloquial and the heightened. There are touches of humour, hints of tragedy, all manner of intricacies. This poet knows what E.M.Forster meant by ‘only connect’, juxtaposing different elements with immense care and clarity: the shoes, the shell, the glasses, the egg-cups, the elephants, they all process and are processed into a dignified courtly music before our eyes – but the poet allows time for a big philosophical question too. I hope you will agree that ‘Outside Chance’ – which should perhaps be retitled ‘The Favourite’ – well deserves the top prize.